The CD contains four drama tracks and three songs, tracklist here. Lyrics in kanji and romaji are available here. Anonymous translations of the songs and drama tracks here. This is the first character CD I’ve actually bought, I confess I’m not a big fan of character songs. There are many voice actors who aren’t that great singers, and I was actually very surprised when I went to check how Hiroaki Hirata and Masakazu Morita sound when singing. (Though I think I’d have ordered this CD anyway even if I wasn’t encouraged by browsing their song samples on YouTube.) My memory of Morita’s voice was from almost 5 years ago when he sang the first Bleach character songs and I was totally floored when I heard his newer stuff. He’s developed tremendously, and Hirata is also a very good singer – though I was told he doesn’t actually like singing very much. The short drama tracks between the songs tie the whole CD together. They’re written by the series creator and screenwriter, Masafumi Nishida, and judging by the characterization the scenes probably take place somewhere between episodes 3 and 7. Barnaby is his early first cour tsun-tsun, and Kotetsu is… well, Kotetsu. I daresay the drama tracks are a bit nostalgic considering how the story in the series is currently proceeding. In my opinion they’re best part of the CD together with the duet. The duet was probably the song everyone (including me) was looking forward to the most, and I wasn’t disappointed. It is quite simply put fun. It’s fun to listen to, fun to sing along to, and just puts a huge grin on my face – especially when they get to the “lalalalala” part in the end. The lyrics are just the right kind of cheesy. Hirata and Morita’s voices work well together (much better than I expected!) and I’m actually left hoping they’d record more duets. The song itself isn’t really groundbreaking in any way, but it’s full of good feeling and definitely the best of the three on this CD. I think that Hirata doesn’t really sound like Kotetsu while singing this. And the feeling from the lyrics gives an impression that the singer is way older than Kotetsu’s estimated age. This isn’t a bad song, and it suits his voice well, but it can’t compete with the duet. There’s this a kind of a mellow feeling that I get from listening to Kotetsu’s song, I can’t really describe it in another way. Of the three, this song left the weakest impression on me. This song is so Barnaby it hurts. The lyrics are – again – cheesy, but more in a comical way with gratuitous Engrish thrown into the mix. Morita has a pretty interesting pronunciation that wasn’t so prominent on the duet and that also leads to unintended hilarity when some words sound different from what they should. Also, he sings fairly well in character – he’s even kept Barnaby’s slight lisp (DOUTHITE?!). I didn’t notice him lisping that badly while singing when I listened to his other songs so I can only jot it down to “being in-character”. The song has a kind of a 90’s pop feel to it, which gives me slight nostalgia. I didn’t really like this song that much at first but now it’s grown on me. The CD came out on Wednesday, and for a character CD it’s been doing incredibly well on the charts. It has been on 1st place on Amazon Japan’s anime music CD ranking, and also as high as the 6th place on the overall music CD ranking there. On the release day it was on 1st place on CDJapan’s daily anime CD ranking and it’s still hanging in the top 10 (and the day before its release it was 2nd on preorder list there). It’s also been on 6th and 5th places on Oricon’s daily CD single list, so it’s probably worth keeping an eye on the weekly ranking too! Thanks for this for review: fantastic as always. I love the duet song, I listen it all the time, and I forced my mother to hear the voice of “Kotetsu”, because it is identical to that of one of the most famous Italian songwriters …. 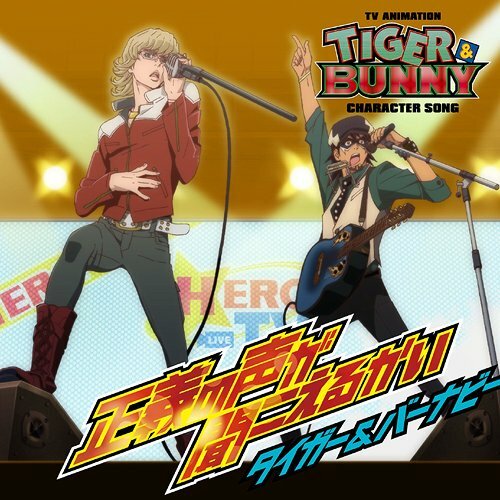 However, I can not in any way to “see” Tiger and Bunny while listening to this song. Morita is Ichigo 100% and Hirata reminds me precisely the Italian singer. This thing that would never happen in my country, makes me love even more if I can, the Japanese people. LA LA LA LA LA LA!!!!! I don’t really like either song, but love the duet and the mini drama is lots of fun. Though I also don’t really hear the characters in how they are singing. Hirata sounds more in character to me for the most part while Morita I don’t even know who he sounds like. Not Barnaby. They should do more songs though. I wasn’t going to order the cd, but ended up doing it once I heard the songs. I had no trouble telling their voices apart for the duet, I thought they both sounded pretty distinct. But I won’t argue tastes! I listen to a lot of Japanese pop&rock so the CD was right up my alley. I do think that regardless of tastes this is one of the best character CDs out there when it comes to overall execution. I guess I’m weird because the duet didn’t impress me that much, while my most favorite track is Barnaby’s, lol. It’s not super-awesome, but I like the beat and how Morita’s voice sounds. Kotetsu’s song is the worst, in my opinion, even though I really like the way Hirata sings. As you said, however, it is true that he doesn’t sound like Kotetsu. I don’t know why people is bothered because they don’t sound the same as when they are talking in the anime. No one when singing sounds the same unless you are a terrible singer shouting at a kareoke or something.